I often tell my non-political friends that you can often find more animosity within the political parties than between them. The egos seem bigger and the stranglehold on power is tighter. There aren’t term limits, so people can seemingly stay around forever. And for the most part, a lot of the business isn’t done in the public eye. That animosity was on display at last week’s Ohio Republican Party State Central Committee Meeting in a stunning display of arrogance. It would have gone unnoticed if it weren’t for Marc Kovac of Ohio Capital Blog taking video of the meeting. Chairman Matt Borges was handpicked by John Kasich to run the party. And Team Kasich has no tolerance for dissent of any kind. Of course, Borges rammed through an endorsement for John Kasich’s Presidential campaign. Everyone expected that as Kasich owns the committee and flexes his stranglehold at each opportunity. No other candidates were even mentioned. But, the most revealing part of the meeting was the endorsement of the incumbent State Central Committee members. The Committee is very inside baseball, so I will break it down. There is a male and female member in each State Senate District, so there are 66 members. These volunteer positions are powerful as they elect the Chairman, approve the budget and issue endorsements. This is why Kasich wants to control it and the party spends money to protect the favored members seats. It’s very challenging for a Committee member to get re-elected without the ORP endorsement as the party will invest money in an opponent to ensure control is maintained. Sometimes there is an “error” and an incumbent’s opponent “accidentally” appears on the ORP mailers. Oops. Those “errors” usually happen in strategically placed races. On Friday, when the Chairman presented a list for endorsement, committee member Gary Burkholder’s name wasn’t on that list. And when he asked why, Borges informed him that a complaint challenging Burkholder’s residency had been filed at the Licking County Board of Elections. Borges showed his cards when he said, “We have filed…,” before attempting to walk it back. But, Borges knew substantial information about this complaint, a complaint that Burkholder didn’t even know about. Borges also had the audacity to complain about challenges to incumbents, as if somehow they were all born entitled to these seats. This is a rather tone deaf statement given the fact that the electorate is so upset with the entitled nature of politicians. But again, this wasn’t normally a televised meeting, and this back and forth wouldn’t have been included in the minutes because the minutes of the meetings isn’t a transcript. It is public because Marc Kovac was there recording it. I had never heard of Gary Burkholder prior to watching this video on Saturday. I don’t know his stances or if I even agree with him on anything. But, I do know that this wasn’t done in a fair manner. And while I don’t mind if someone has an opinion that differs than mine, what I can’t tolerate is deceit and unfairness. And that is what happened here. I contacted the Licking County Board of Elections to get a copy of the complaint. It was filed by a man named Steven Spach. The complaint contains no evidence that Burkholder doesn’t live in the district. 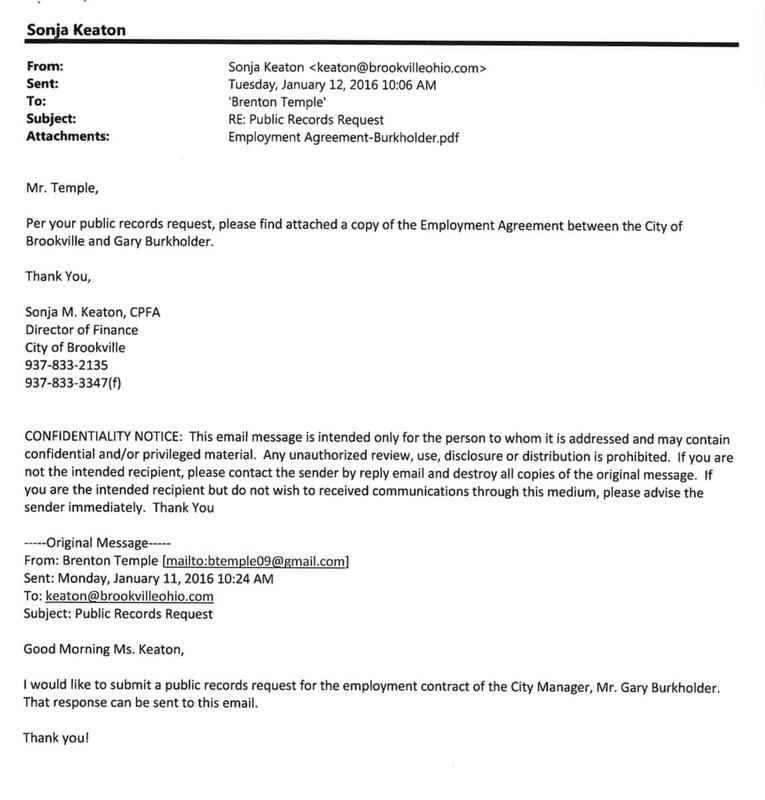 It makes an (incorrect) assumption about Burkholder’s residency requirement at his job. But, the intent wasn’t necessarily meant to be a strong one. Borges simply needed a reason not to endorse Burkholder, because Kasich doesn’t find him useful. 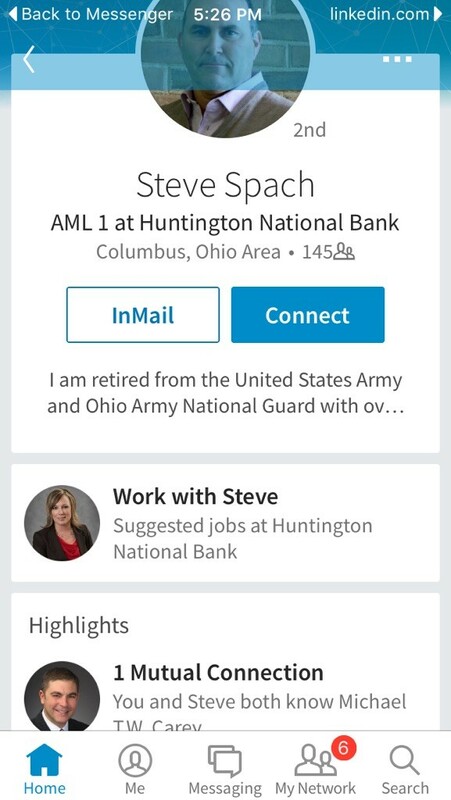 I searched for Steven Spach to see if I could make a connection. Remember that most people don’t even know about these State Central Committee seats. And the few people who do wouldn’t be aware of anything about Gary Burkholder’s employment. There had to be a connection. I didn’t find it until I went on LinkedIn. We are both connected to Mike Carey. Mike is someone I have held in high regard. He is also coincidently challenging Gary Burkholder for his seat on the State Central Committee. Remember that Borges said, “we have filed…” a complaint. What was the purpose of this? 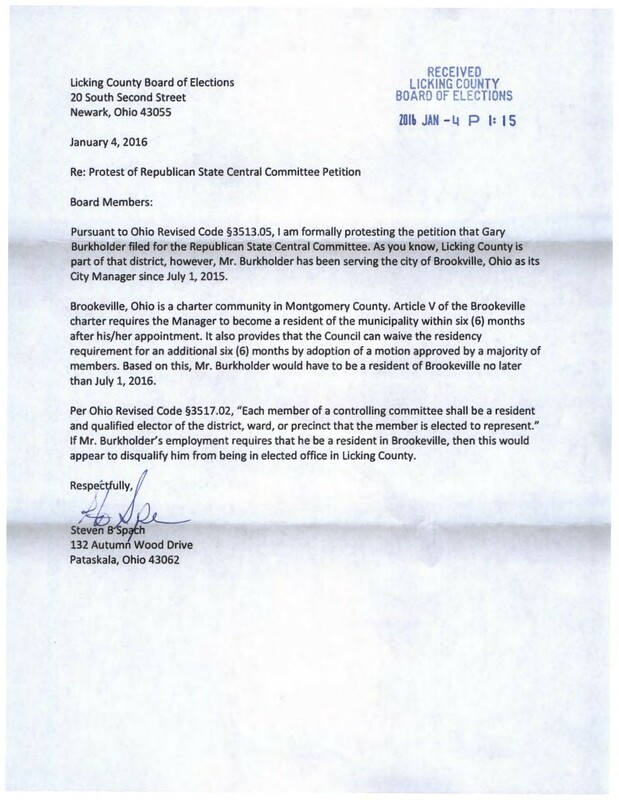 It has become clear that Brookville’s residency requirement was waived for Burkholder. Was the purpose behind the Ohio Republican Party’s pursuit of his contract an attempt to threaten Burkholder’s job? Is this the price is for not being a rubber stamp for John Kasich? And why does the Kasich administration want to remove Burkholder in the first place? The truth is that Team Kasich has wanted Gary Burkholder gone form the ORP since before Matt Borges even became chairman. Why? Because Burkholder opposed the same type of strong-arm tactics that Kasich used to oust Borges’s predecessor, Kevin DeWine. One committee member from Licking County expressed what Democrats hope happens again and again, namely Republicans trashing other Republicans. “We have elected officials who are now actively campaigning against people on this committee who helped elect them,” said Gary Burkholder to a crowd that included Kasich warriors Jai Chabria, a close assistant working in the Office of the Governor, lobbying partners Doug Preisse and Robert F. Klaffky, long-time staffer and good buddy Don Thibaut and Lt. Gov. Mary Taylor’s chief of staff, Laura Johnson. We reported on an email that same year that divulged that Governor Kasich actually recorded a robocall for Gary Burkholder’s opponent. I also just recently learned that Governor Kasich has endorsed another SCC candidate and is doing the same robo-calls against an Incumbent SCC member, Gary Burkholder. The Columbus Dispatch also reported on Burkholder’s objection to Team Kasich’s tactics. Burkholder said it was hypocritical for Kasich’s allies — later naming Lt. Gov. 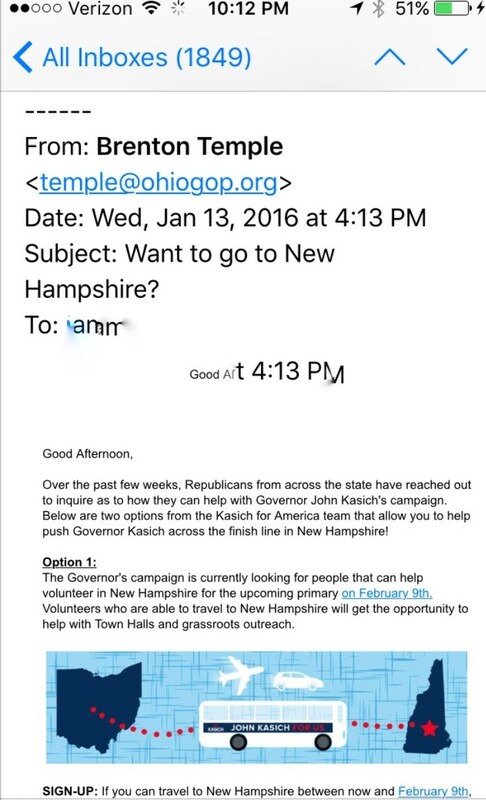 Mary Taylor, Davidson, Preisse and others — to make calls to county GOP chairmen urging them to support the Kasich slate. Jai Chabria, senior adviser to Kasich, attended the meeting, saying he was doing so on his own time. Also on hand was Laura Johnson, Taylor’s chief of staff. Again, I don’t know anything about Gary Burkholder outside of this situation. And frankly, I don’t care what his positions are or who he is supporting for President. But, I do care that things are done fairly. And this was inherently unfair. This was absolutely disgraceful. What’s pretty pathetic is that the almost all the other committee members sat there in silence. Perhaps, like Burkholder, they weren’t given advance notice of this, but it has been several days since then. Where are their voices? Are they rubber stamping this? The Licking County Board of Elections dismissed this challenge. It had no validity as it was simply meant to be a reason to withhold Burkholder’s endorsement. Without an endorsement from the ORP, a county party could endorse one of his opponents allowing the ORP to fund that person’s campaign. I spoke with Gary Burkholder today and he would like Chairman Borges to call another meeting so he can get endorsed. And I should add that this meeting should have a quorum, so an endorsement can actually be issued. It is obvious that Team Kasich wanted this man booted. And rather than playing fair, they had to play dirty. But, thanks to a video, we know the truth. This is the behavior that many of us have witnessed from Team Kasich. One hundred percent uniformity is demanded. And this is retribution you can expect if that demand is not met. Borges previously called State Treasurer Josh Mandel a “bit player” for supporting Marco Rubio. Borges is supposed to defend Republicans, but his allegiance is obviously only to John Kasich. Knives are out for the others. Chairman Borges, when will the meeting be held to endorse Gary Burkholder? And when will you be giving a public apology?